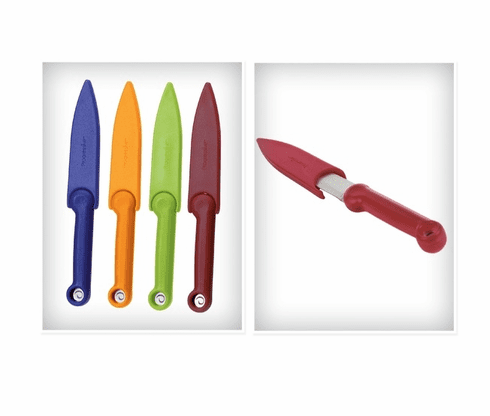 Reduce the risk of cross contamination during food prep with this set of 4 color-coded Food Safety Paring Knives. Use red for meat, blue for seafood, orange for poultry and green for vegetables. Kitchen Paring Knives feature sharp 3.5Ó (8.8 cm) long stainless steel blades. Protective snap-on covers included for safe storage. Bold colors are easy to identify and find in a drawer.